Our Academy is located in Clarkes Bridge House – a state-of-the-art, four-storey building in the historic heart of Cork city, in close proximity to the main business and retail areas of the city and close to a wide variety of restaurants and cafes. Self-access and internet centre with free computer/internet access. Vending machine serving hot and cold beverages and snacks (chocolate, biscuits, crisps etc). Wireless internet available free throughout the building. An extensive range of textbooks and text materials. Am I allowed to speak my mother tongue at the Academy? Only in an emergency! Try to speak English as much as possible in the classroom and outside of class time. The more you try to practice your English the faster you will make progress. Can I use the internet at the Academy? Yes, the internet is free for all students. There is wireless internet access throughout the building if you wish to bring your own laptop. We also have fixed computers in our student lounge. What dates is the Academy closed? The school will be closed on the following days in 2018: March 19th, 02 April, 07 May, 04 June, 06 August, 29 October. The school will also be closed for the Christmas period from 22 December 2018 to 06 January 2019.The school will reopen on 07 January 2019. The school will be closed on the following days in 2019: March 18th, 22 April, 06 May, 03 June, 05 August, 28 October. The school will also be closed for the Christmas period from 21 December 2018 to 05 January 2019.The school will reopen on 06 January 2020. Yes,there is a Social Activity Programme organized by the academy and some of these activities are free while some incur a fee where a private coach is hired or entrance fees are required. A member of staff usually accompanies students on these activities at no additional cost. For more info visit the Social Activity Programme page. General English courses start every Monday except where there is a public holiday Monday and the school is closed. In these cases courses will commences on the following Tuesday. Individual Tuition: On any weekday. Students have to be 18+ years when they start the course. There are 12 students maximum per class. What happens on the first day at the Academy? The first day at Cork English Academy is very important. Please arrive at the Academy 30 minutes before your scheduled course start time on your first day. Bring a pen and some paper, your passport or photo ID. Please come to reception to register for your course. You will have a short speaking test on your first day followed by a presentation/introduction to the school. Once the results of your speaking test are combined with your overall level test results you will be directed to your class room by 10.00 for morning students/13.30 for GE20 Afternoon students and 14.15 for GE15 Afternoon students. Do I have to buy the course book? Your course books are not included in your course fees. Course book fee for 1 to 12 week bookings is €45. Course book fee for 13 to 25 week bookings is €90. How many levels are there in the Academy? The curriculum is based on the Common European Framework and uses its six proficiency levels from A1 Beginner to C2 Advanced. There may be 2 or more classes at the same level. Students receive a certificate of attendance provided they have attended at least 80% of their course. If you take an examination the school will send you the examination certificate. Family homes are not usually located in the city centre in Ireland. All host families are on a city bus route. One bus journey from host family to city centre. If you wish to live in the city our self-catering shared apartments are all an average of 15 minutes’ walk to the Academy with the closest at just 100 metres from the school. What happens if I want to change my accommodation leaving date? Normally the Academy requires a minimum of 2 weeks notice if you wish to leave your host family or shared apartment before your booked leaving date or extend it past your original booking. Please contact us for more information about accommodation changes. Can I choose a host family or apartment? How do I book a course at Cork English Academy? Complete the online application form and submit it to us. We will check the details and reply to you within 48 hours (Monday – Friday). If you prefer you can send us an email at [email protected]. We will contact you to tell you if we have a place available, but we cannot process your application until we have received proof of payment of your deposit, or full fees (at least 28 days before the course begins). Payment is by bank draft or credit card. Full details are available on our booking form. Yes, a deposit of €200 is required to secure your place on a course. When do I have to pay full fees? The balance of the fees must be paid at least 28 days before the course begins. It is deducted from your total fees and cannot normally be refunded in case of cancellation. The registration fee is not refundable. If you cancel before your course begins the balance of the accommodation deposit will be refunded after any cancellation charges have been paid. For visa requiring applicants the cancellation policy is as follows: If you cancel your course and/or accommodation before arrival due to visa refusal or you are refused entry to Ireland, we shall refund your fees in full minus a €200 cancellation charge and the registration fee charge of €65. You must apply for a refund within six months of refusal date. You will be required to submit the original letter of refusal to us for us to give you the refund. If you cancel your course and/or accommodation later than two weeks before the commencement date for any reason other than visa refusal, we will refund 90% of your fees. If you cancel your course and/or accommodation after arrival, leave it early or miss any lessons, including in case of sickness, refund is not usually given but a credit may be considered at the discretion of the Academy. For non visa requiring applicants the cancellation policy is as follows: If a course and/or accommodation booking is cancelled 28 days before student arrival a full refund is returned. If a course and/or accommodation booking is cancelled less than 28 days before start date full fees are returned subject to a €200 cancellation charge and the registration fee charge of €65. If an accommodation booking is cancelled 14 days or less no accommodation fees are returned. If a booking is cancelled after arrival, where a student leaves early for any reason including in case of sickness, refund is not usually given but a credit may be considered at the discretion of the Academy. Students from The European Union and certain other countries do not need a visa to study in Ireland. Please check our Visa Information Page for further information. Please check with the Irish Embassy or Consulate in your country of residence for further information. We strongly recommend that you have insurance to cover health, travel and accidents and course cancellation. Students on an Academic Year programme are required to have Medical Insurance. You can book this through the school by making a request at time of booking. What happens before I travel to Ireland for my course? You will receive an information pack from us at least 10 days before your course start date with confirmation of your airport transfer (if requested), details of your accommodation (address, map etc), details of what to bring with you to Cork and a schedule for your first day at Cork English Academy. What should I bring with me to Cork? Although we do enjoy warm sunny weather during the summer months in Ireland it cannot always be guaranteed and so it is a good idea to be prepared for the fact that the weather may change several times in one day. Bringing an umbrella is always a good idea, also a jacket and sweater, even in summer. Make sure you have warm clothes for winter. Also bring passport size photographs – these are very useful for student cards, travel cards etc. and remember to bring pens and paper to class. What happens if I need a doctor? Please come to the office and we will help you to make an appointment. If you are very ill or have a serious accident the numbers for medical assistance in Ireland are 112 or 999 (for emergencies only). Please come to the Academy office for help during school hours. If you have a serious problem (an emergency) outside school hours you may call our emergency number 086 7900860. Can the Academy arrange my airport transfer? 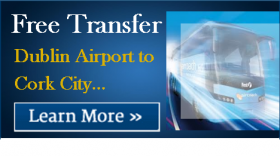 If you are staying with a host family, airport transfers from Cork Airport are included in your accommodation fees. For self-catering students we can arrange a taxi to collect you from Cork, Dublin or Shannon airports. There is also a bus service which runs regularly from Cork airport to the city centre. A bus service from Dublin airport to Cork city runs regularly throughout the day if you are arriving in Dublin airport. There is also a regular train service from Cork to Dublin but please note that the train station is a bus or taxi ride from the airport. Contact the Academy for further details.